Diamond Lounge 14 seater- This Luxury 14 seater Limousine is ready to chauffeur you and your guests around in the finest form of transport available in Perth, our staff will ensure you and your guests will be having a time to remember with the red-carpet rolled out on every entry and exit, karaoke fired up and all while you are enjoying the Luxury our coach has to offer. This bus Being 14 seater is a full BYO Drinks! bus! The coach features a on board bathroom for you convenience! Sed consequat, leo eget bibendum sodales, augue velit cursus nunc, quis gravida magna mi a libero. Nunc nonummy metus. Fusce ac felis sit amet ligula pharetra condimentum. Nunc nulla. Morbi mollis tellus ac sapien. 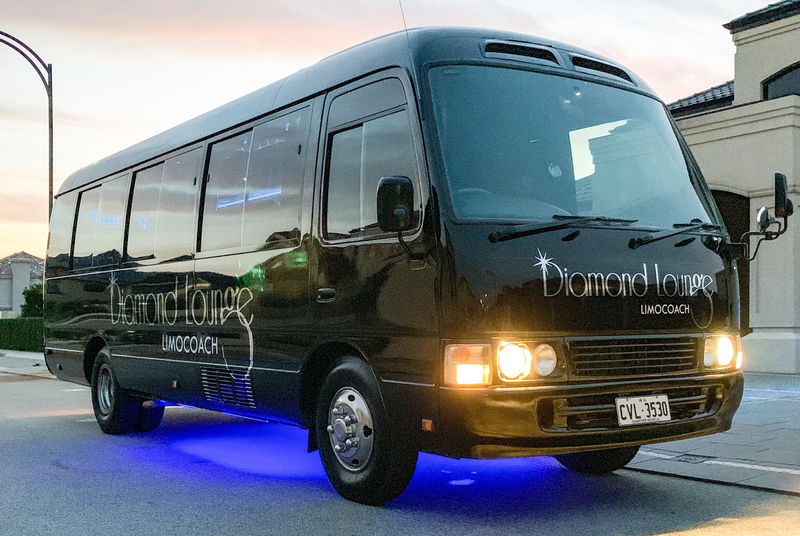 Book your Diamond Lounge experience today, our experienced staff are ready to create the perfect transport for you and your guests. Simply click the button below and complete the form to get the wheels moving. If you would prefer a chat, give is a call on 0433 DIAMOND (043 3426663).